The Oasis is a lightweight replacement top end for the Ruger MKIII & MKII pistols. Constructed from one solid billet, there are no ugly fragile seams between the suppressor and the receiver. Accuracy and sound performance are outstanding. 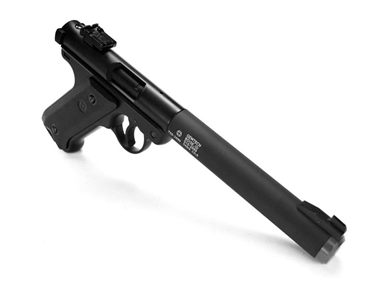 The overall length of the suppressed weapon is significantly less than most integral .22's available. Weight, size, accuracy, terminal ballistics and sound performance are outstanding making this and ideal companion for the dedicated outdoorsman. The Oasis consists of the suppressed barreled receiver (with adjustable sights) only and does not include the magazine grip or trigger assembly. The Oasis is only two inches longer than the standard Ruger MKII bull barrel. Specifications: Caliber: .22LR. Length: 5 in. Diameter: .98 in. Weight: 21 oz as shown / 6.7 oz Oasis alone.